This review commences by briefly describing the scale and importance of marine shrimp within the global aquaculture sector. Typical farming and feeding practices for shrimp grow-out production are summarized and the importance of good on-farm feed management is stressed. Guidelines on feed handling, storage and feeding are provided. The review concludes with a summary and some recommendations for future research. The shrimp aquaculture sector represents one of the most lucrative and fastest growing segments of the global seafood industry. Valued at over US$16.6 billion, global farmed shrimp production was estimated at nearly 3.78 million tonnes in 2010, with production increasing over three-fold from 1.1 million tonnes in 2000, and growing at an average annual rate of 14.5 percent since 1950 (FAO, 2012). Moreover, the whiteleg shrimp (Litopenaeus vannamei) was ranked first in 2010 in terms of total farmed fish and crustacean production by value, at US$11.23 billion (FAO, 2012). In 2010, the bulk of global shrimp production was restricted to the culture of two major species, the whiteleg shrimp (L. vannamei; 2 720 929 tonnes or 72 percent of total production by weight) and the black tiger prawn (Penaeus monodon; 781 582 tonnes or 21 percent). Other minor cultivated species included, the kuruma prawn (P. japonicus; 56 739 tonnes or 1.5 percent), the fleshy prawn (P. chinensis; 45 339 tonnes or 1.2 percent), the Indian white prawn (P. indicus; 27 325 tonnes or 0.7 percent) and the banana prawn (Fenneropenaeus merguiensis; 19 821 tonnes or 0.5 percent) (FAO, 2012). Shrimp aquaculture production is reported to the Food and Agriculture Organization of the United Nations (FAO) by 59 countries, with the major producing countries in 2010 being China at 1 448 019 tonnes or 38.4 percent of total global production by weight, followed by Thailand (566 796 tonnes or 15.0 percent), Viet Nam (478 700 tonnes or 12.7 percent), Indonesia (379 327 tonnes or 10.1 percent), Ecuador(223 313 tonnes or 5.9 percent), India (112 100 tonnes or 3.0 percent), Mexico (104 612 tonnes or 2.8 percent), Malaysia (87 202 or 2.3 percent), Brazil (69 422 tonnes or 1.8 percent), and the Philippines (55 899 tonnes or 1.5 percent) (FAO, 2012). Farming practices currently employed for shrimp vary widely both between and within countries, which vary according to the species farmed, the financial resources of the farmer and the production method employed. In general, shrimp production methods can be divided into three basic types depending upon the shrimp stocking density and the external inputs received over the production cycle; these range from extensive non-fed pond-based farming systems, to semi-intensive compound feed-fed pond-based farming systems, to intensive compound feed-fed pond and tank-based farming systems. It follows therefore that the feeds and feeding methods employed by shrimp farmers also vary considerably between and within countries. This is in marked contrast to commercial poultry and salmon farming operations, where for the most part animals are raised within intensive production systems at similar densities and culture environments and fed nutritionally complete diets over the duration of the production cycle. Of these, the commercial shrimp feed manufacturer has direct control over the first two factors, while farmers and their staff have direct control over the last three. It follows, therefore, that the eventual nutritional performance and economic success (or failure) of a shrimp feed is dependent upon a close collaboration and partnership between the feed producer and the farmer and his staff. 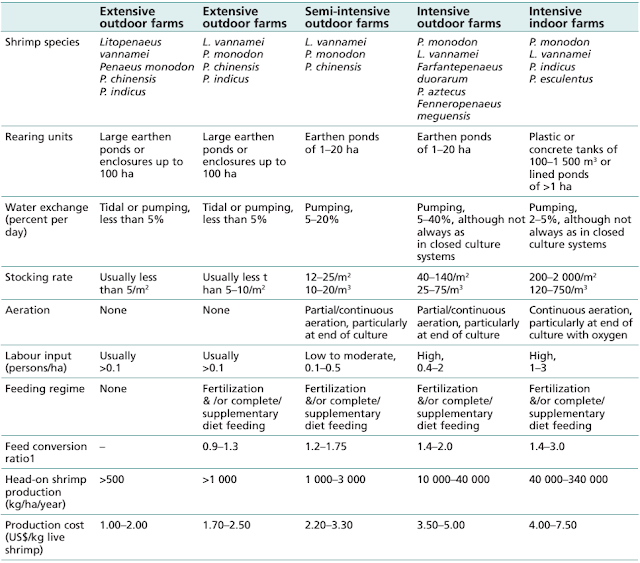 Shrimp feeds and feeding usually represent the largest operating costs (typically between 40 and 60 percent) of most semi-intensive and intensive farming operations (Molina, 2009). The importance of good on-farm shrimp feed management can be seen from the reported variation in feed conversion ratios (FCR) observed between 174 different black tiger shrimp farms fed the same commercial shrimp diet in Thailand (Figure 2). FCR and observed shrimp production costs ranged from 1:1 to 2.6:1 and US$1.2 to 2.60/kg shrimp harvested, respectively. 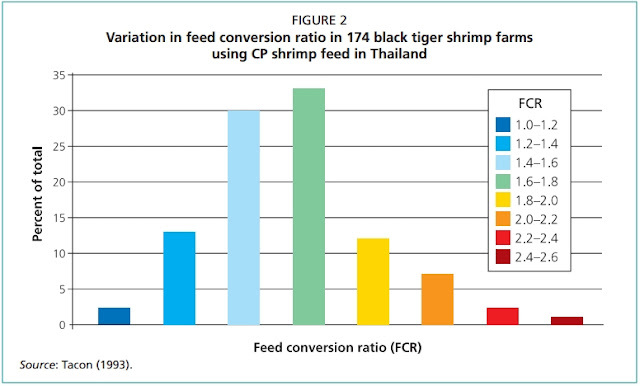 These variations in shrimp feed performance show the wide variations that commonly exist between individual shrimp farmers, depending upon the farming and feed management practices employed. It is estimated that the global average farm eFCR (economic feed conversion ratio) for shrimp and salmon in 2008 was 1.5:1 and 1.3:1, respectively; 5.06 million tonnes of shrimp feed and 2.04 million tonnes of salmon feed being consumed for the production of 3.40 million tonnes of shrimp and 1.57 million tonnes of salmon in that year (A.G. J. Tacon, unpublished data). Thus shrimp farming has a poorer feed conversion efficiency than salmon farming. The difference in eFCR between these two major farmed species groups is even more remarkable if one considers that it usually takes 18 months to grow a salmon from egg to market size (typically 3.5–4.5 kg), while shrimp have a much shorter culture period (5 to 7 months) and a much smaller market size (typically 15–30 g), depending upon the species farmed. Farmed salmon are almost exclusively reared at high densities within open-water cage enclosures and fed high-lipid nutrient-dense feeds (Crampton et al., 2010). • Farmed shrimp have poorly developed eyes and vision, and consequently reply primarily on chemical attraction and stimulation to locate and consume their food, including artificial feeds. As a direct consequence, artificial feeds for shrimp generally have to remain immersed in water for prolonged periods of time (typically for several hours) prior to being externally masticated and then consumed (Obaldo and Masuda, 2006). The significance of the above is that special consideration must be given to feed formulation and feed manufacture when formulating and producing shrimp feeds, including: the need to tailor dietary nutrient levels to the intended culture system and the endogenous availability of natural food organisms; the need to produce artificial feeds that are both physically water stable and chemically attractive and palatable to farmed shrimp. Although outside the scope of this paper, both of these factors have very important implications for the ultimate performance and success of formulated shrimp feeds (Figure 1). Shrimp feeds are composed of formulated mixtures of ingredients containing 40 or so essential nutrients (e.g. proteins and amino acids, fats and fatty acids, carbohydrates and sugars, minerals and trace elements, and vitamins) that are prone to deterioration and loss or destruction upon prolonged storage prior to feeding. Nutrient losses and destruction may result from the prolonged exposure of finished feeds to unfavourable storage conditions on the farm, either due to inadequate shelter and protection of the feed from the natural elements (light, heat, humidity, air and water) and/or due to microbial/pest infestation (bacteria, fungi, insects, rodents). As a general rule, feeds should be stored under cool well-ventilated conditions and not subjected to direct exposure to the sun and rain, including extremes of heat andhumidity. Under the above ambient conditions, feed shelf life should be not more than two to three months under tropical/warm (20–30 oC) storage conditions and not more than four to six months under temperate/cold (10–20 oC) storage conditions. Whenever possible, formulated feeds should be stored in a dedicated roofed storage facility and the feeds used on the farm on a ‘first-in – first-out’ basis. In contrast to terrestrial farm animals and farmed fish where compound feeds can be fed on a visual basis according to the appetite of the animals or to a preset feeding level, pond-raised shrimp are not directly visible to the farmer during feeding, and as such, animals have to be fed ‘in the dark’. As a consequence, compound shrimp feeds are usually fed by farmers at a fixed daily rate based on shrimp body weight and an estimate of the total shrimp biomass present in the pond or tank, with the feed usually being applied by hand or mechanically several times daily over an 8 to 12 hour working day. However, there are practical difficulties in accurately determining the total shrimp biomass within commercial grow-out ponds, which typically vary in size from <1 000 m2 to >20 ha . In estimating dietary feeding levels for a particular diet and dietary nutrient density, farmers are usually forced to feed their animals on a targeted/expected weekly growth response (or to attain a certain final shrimp target weight over a preset culture period). This practice comes with a consequent risk of over- or under-feeding, environmental pollution (due to over-feeding), and suboptimal FCR and growth. • Shrimp body weight: compound feed intake decreases with increasing body weight and decreasing metabolic rate over the culture cycle. • Water temperature: compound feed intake and growth increases with increasing water temperature up to an optimum level (typically between 29 and 31 oC for L. vannamei and P. monodon), with water temperatures - and consequently dissolved oxygen levels - sometimes varying widely over a working day depending upon the culture system used and season. • Natural food availability: compound feed intake increases with decreasing natural food availability within the culture system (which includes natural foods present within the water column and/or pond bottom), with pond bottom natural food availability generally decreasing with increasing shrimp stocking density, increasing shrimp weight and increasing total shrimp biomass over the culture cycle. •Compound feed formulation and nutrient density: feed intake and growth are dependent upon the water stability, palatability and nutrient composition of the diet fed; the better the water stability and palatability and the higher the nutrient content of the diet fed, the higher the potential feed intake and feeding response of the diet (but not always). • Shrimp feed application method, including frequency and timing of application, and feed consumption monitoring method: compound feed intake and growth are usually easier to control and monitor during daylight hours within smaller hand-fed intensively stocked ponds (as compared with larger semi-intensively stocked ponds), with optimum feeding frequency and timing of application being dependent upon the size of the shrimp and the nutrient density of the diet fed, and generally being highest for small, rapidly growing shrimp, and thereafter decreasing with increasing shrimp size. usually administered within larger farms by workers who receive the lowest or minimum salary, usually with little or no incentives for increased worker incomes through achieving improved feed performance and shrimp growth given by farm owners. • Shrimp moult cycle, lunar cycle phase and feeding behaviour: feed intake and growth are dependent upon the physiological state and condition of the shrimp, with feed intake usually decreasing immediately prior to and during the moulting cycle and natural feeding activity being highest during non-daylight hours. • Shrimp health and wellbeing, including ecosystem health: feed intake and growth are generally lowest for stressed and diseased shrimp, including those in polluted and environmentally stressed pond ecosystems. In view of the above variables, it is perhaps not surprising, as noted in Section 4, that the observed average shrimp eFCR (eFCR includes mortality, and refers to the relative quantities of feed fed per unit of fish or shrimp harvested) in 2008 was estimated to be about 1.6:1 (as compared with 1.3:1 for farmed salmon). Sadly, to date, dietary feeding regimes have more often than not been related to the convenience of the feeding technicians or farm workers during their working day, rather than to the species-specific behavioural and nutritional feeding requirements of the cultured shrimp species. Shrimp aquafeed management aims at making available to the animals the best quality, formulated aquafeed in the proper amounts and at the right times and locations. Feeding methods and techniques are as important as feed quality and are closely interdependent. Feeding practices must be continually modified and adapted to account for natural and induced changes in feeding activity and preferences as the animals grow and/or environmental conditions change. Knowledge of shrimp behaviour and feeding habits and a continuous feedback on pond environmental parameters and shrimp population are factors critical for successful feed management. Management of formulated aquafeeds is a sequential process that is only as strong as its weakest link. As it did some 30 years ago at the dawn of the industry, it still includes feed selection, handling and storage; feed application methods; and feeding regimes and adjustments to feeding rates. Often, observed differences in performance between different feeds are the result of the management received and not a result of differences in formulation, ingredients or manufacturing. 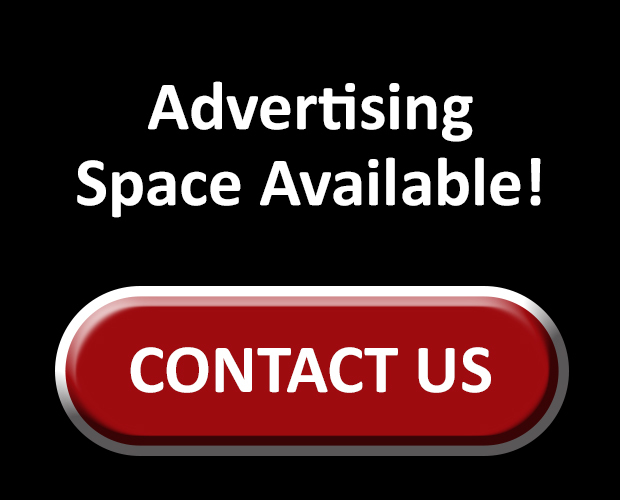 If not properly managed and fed, the best formulated aquafeed will generally be not much more than expensive fertilizer. Adequate feed management methods are critical for efficient production and to minimize environmental impacts. Shrimp production systems and their feed management must be considered together and require an understanding of the biological aspects of the targeted species and the chemical and biological processes that control water and bottom quality, and require continuous system monitoring and feedback to provide appropriate and timely inputs and adjustments. Effective practices will produce maximum shrimp growth and survival concurrent with the lowest feed conversion with minimum impact to effluent quality. Inadequate feed management will lead to suboptimal production, can promote the onset of various diseases and can lead to water qualityrelated problems. Several sequential steps are involved in proper feed management: feed selection; reception, storage and handling; application methods; and feeding regimes. 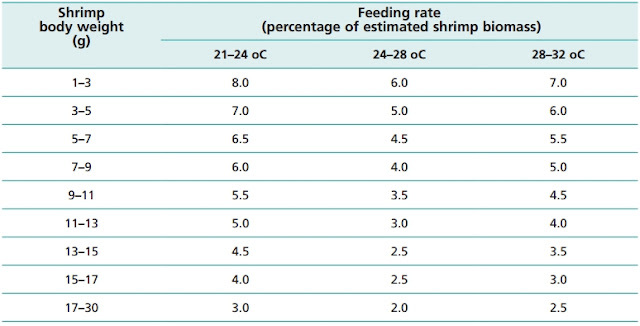 Choosing when to feed requires the determination of shrimp activity patterns, feeding frequency and time (subject to change with geographical location, species, age, size, stocking density, season, unusual environmental conditions and other stimuli). Calculating feed rations involves estimating survival, population size and biomass, size distribution and natural food availability. Adjusting feed input involves population sampling and monitoring of various water parameters. Proper feeding strategies must consider physiological processes that affect feed intake and digestion in the targeted shrimp species. These include relationships between feeding activity and circadian rhythms, gastric evacuation times, moulting cycle stage, etc. Shrimp are bottom feeders, and it is difficult to estimate feed consumption rate unless feed trays or lift nets are used. For many years, trays have been the best tool available to manage and adjust feed inputs and prevent under- and over-feeding. 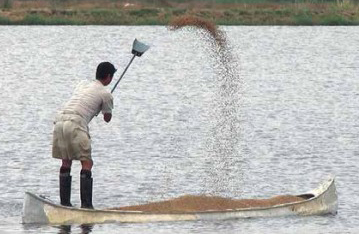 Inefficient management methods commonly include inadequate handling and storage practices for both bulk feed storage at farms and after feed distribution to pond side for daily feedings. Ineffective practices often include applying feed during times convenient for employees but not necessarily optimal for shrimp and underestimating the importance of proper training, remuneration and motivation of feed management personnel. The development and use of compound aquafeeds has been a major factor in the global expansion of shrimp farming, and efficient feed management is critical to maintain and improve the financial and environmental viability of the industry. There is still much potential to improve and optimize responsible and efficient feed management practices that can be species-, area- and even season-specific, to optimize production efficiency, minimize environmental impacts, promote maximum biosecurity, and promote cost-efficiency and profitability. Phase-to-phase feeding programmes must be designed to target the best feed nutrient profile and feed presentation at a specific culture stage, environmental and rearing condition. Culture challenges such as disease, poor water quality, and high stocking densities can be minimized with the proper feed design. On the other hand, feeds must be aligned to account for the availability of natural food in ponds in order to spare critical and expensive nutrients, such as proteins, vitamins and minerals. • optimising overall management of production systems, of which feed management is only a component in a sequential and additive process from stocking to harvest. Tacon, A.G.J., Jory, D. and Nunes, A. 2013. 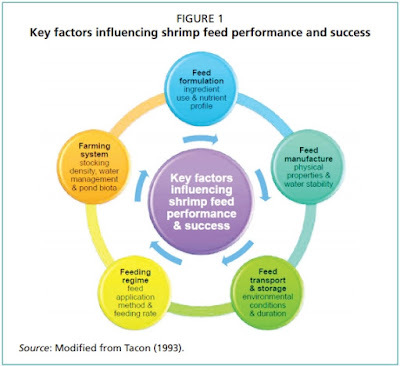 Shrimp feed management: issues and perspectives. In M.R. Hasan and M.B. New, eds. On-farm feeding and feed management in aquaculture. FAO Fisheries and Aquaculture Technical Paper No. 583. Rome, FAO. pp. 481–488.